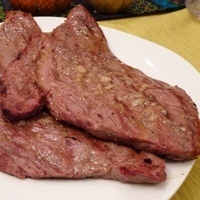 These steaks are a treat and a great way to make an inexpensive cut of meat memorable. You can use bottom round (best), top round, or a thin cut sirloin for this dish. The steaks should be cut about a 1/2 thick. Mine were a little thicker, so I pounded them with a mallet to thin them. In Cuban restaurants, this recipe is called palomilla. Steven Raichlen adapted this from a restaurant in Miami called Victor's Cafe, and put the recipe in his excellent BBQ Bible. I adapted this from that recipe. You won't be disappointed! Prepare the adobo (marinade) by combining the garlic, salt, cumin, and pepper in a mortar and grind slowly with a pestle gradually working in the lime juice and olive oil until you have a smooth paste. Or, to save time, put all these ingredients in a blender and process to a smooth paste. Brush some of the adobo on the steaks 10 minutes in advance of placing on the grill. This is not necessary, but will impart additional flavor to the steaks. When grill is ready, oil grill grate. Brush onions with oil and place on the hot grate. Grill for 4 minutes on each side, seasoning with salt and pepper. Once the onions are on the grill, brush the steaks with the adobo and place on the grill alongside the onions. Grill for 3 minutes per side for medium rare, basting with the adobo. Transfer the steaks to a platter or individual plates and brush one final time with the remaining adobo using all of it. Let stand for 3 minutes, then serve with the grilled onions. This dish goes well with rice, rice and black beans, tortillas, or garlic bread. Our kids and I really enjoyed these steaks. The flavor was pungent but mild and really accentuated the meat. It reminded me of steak John and I used to get at a cuban place near Weehawken, NJ. Tasty! This is a beautiful marinade! I will be trying this recipe this weekend. Coming from a West Indian famil, we just can't eat ANYTHING without a unique flavor - this is a beautiful memory maker! ;) Thank you for sharing this. Thanks for the nice comment, Stacey. Hope you enjoy it! Wow ! Best tasting steak I have had in years. The lime garlic marinade was great. Hey John, love this recipe,excellent flavor profile! I think it would also be fabulous atop a bread salad! Thanks for sharing!!! I have not done something Cuban... i would definitely try to make this one. Interesting. Great recipe. The whole family loved the garlic - lime marinade on the steaks. Will use this again. Glad you enjoyed them, Greg! If you get a chance, please come back and add a rating. Lot's of people won't try a recipe if it doesn't have at least 4-5 ratings, so your rating will really help! Hi Lana - great catch! I've updated. Lime juice is the alternative to sour orange juice, and in fact I used a mix of lime juice and orange juice (not lemon juice and orange juice) to make it. I've updated the recipe. Hope you enjoy it, Malissa!